136 Teams competing for the first SB World Championship! 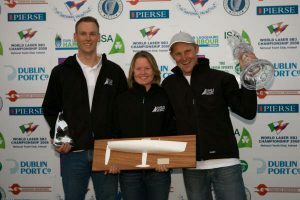 After an early dogfight with his closest rivals in the final race, CARVETH pulled off a stunning comeback from the bottom half of the fleet to finish second and take the World title. 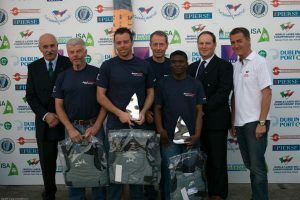 David HUDSON‘s South African Team took second place, with another Brit, David LENZ in third. 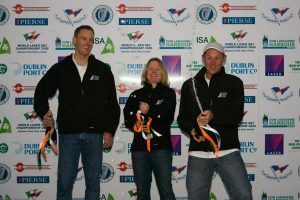 British teams filled the next four places, with the Australian team of Daniel GEOGHEGAN seventh, Peter O’LEARY of Ireland in eighth and then two more Brits completing the top ten. As far as World Championships go, it was a stunning debut for the Laser SB3 class, a week of blissful weather finishing in a nail-biting climax during the final race. 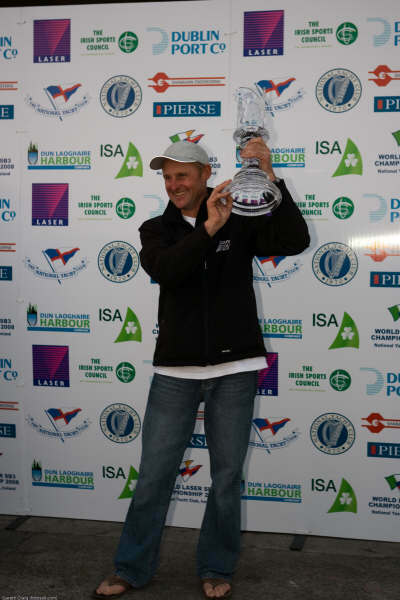 First race of the day went to an Irish skipper, O’LEARY. Then, as the 13th race of the series loomed, the overnight leader, Craig BURLTON (GBR), saw his luck turn when a disastrous 58th place put him 12 points adrift of the lead and out of the reckoning heading into the final two races. As the countdown began, the top three were gunning for each other and ended up way down the pecking order after hawkish pre-start combat. 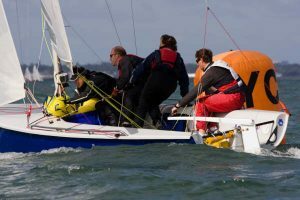 CARVETH, who led by two points going into the last race, describes how the final race played out: “David HUDSON was in the picture and Dave LENZ put a first in during the morning race which then meant he became very strong, and he became the main issue. He was definitely the man we had to worry about. “We all had a pretty bad start, then we did a 360-degree penalty, and of course that put us that bit further behind. We got to the top mark in the thirties, pretty deep, but David wasn’t that far ahead of us and then Dave LENZ was behind us. CARVETH, finishing second, put more distance between himself and LENZ, who finished 28th, and with Dave HUDSON six back in eighth place, the title looked to be theirs. However, with several boats being caught for false starts during the week, the champagne was put on ice on CARVETH’s boat and celebrations were muted. “Although we were aware that we could win, there was also another eight people that could win this morning,” said CARVETH, which meant that calculating the points made for mixed emotions. 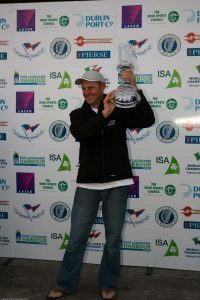 By the time CARVETH came on shore, however, his name was already being etched on the trophy. “We’re absolutely over the moon about it,” said CARVETH, paying tribute to his crew, who all fly off with him to another event which starts in Great Britain on Saturday morning. Silver fleet glory goes to Ireland, with John DRISCOLL’s crew taking the overall win. 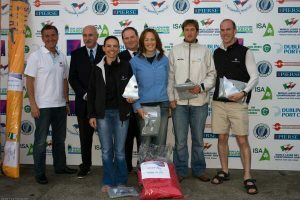 And as celebrations kick off, the National Yacht Club can put a feather in its cap for having hosted the most smoothly-run event in the country this year.